Riesce ad individuare ostacoli da 3cm a 6mt di distanza con un campo molto ampio. Completamente assemblato e testato. L'SRF08 e' un sensore ad ultrasuoni di grande sensibilita' e precisione. Riesce ad individuare ostacoli e oggetti, anche molto piccoli, fino ad una distanza di 6 metri! Grazie alla presenza di un potente microcontrollore, tutte le funzioni di rilevamento e calcolo sono gestite direttamente dal sensore, per ottenere la lettura e' sufficiente fare una interrogazione tramite protocollo I2C e il sensore ci restituira' la distanza direttamente in microsecondi, millimetri o pollici. L'SRF08 e' anche dotato di un sensore fotoresistivo che consente la lettura, sempre tramite protocollo I2C, dell'intensita' luminosa ambientale. Semplice da utilizzare, facile da collocare anche nei robot piu' piccoli, potente; l'SRF08 trova applicazione in moltissime situazioni. Communication with the SRF08 ultrasonic rangefinder is via the I2C bus. This is available on popular controllers such as the OOPic and Stamp BS2p, as well as a wide variety of micro-controllers. To the programmer the SRF08 behaves in the same way as the ubiquitous 24xx series eeprom's, except that the I2C address is different. The default shipped address of the SRF08 is 0xE0. It can be changed by the user to any of 16 addresses E0, E2, E4, E6, E8, EA, EC, EE, F0, F2, F4, F6, F8, FA, FC or FE, therefore up to 16 sonar's can be used. In addition to the above addresses, all sonar's on the I2C bus will respond to address 0 - the General Broadcast address. This means that writing a ranging command to I2C address 0 (0x00) will start all sonar's ranging at the same time. This should be useful in ANN Mode (See below). The results must be read individually from each sonar's real address. 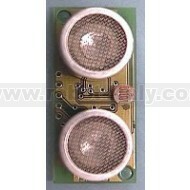 We have examples of using the SRF08 module with a wide range of popular controllers. The SRF08 appears as a set of 36 registers. Only locations 0, 1 and 2 can be written to. Location 0 is the command register and is used to start a ranging session. It cannot be read. Reading from location 0 returns the SRF08 software revision. By default, the ranging lasts for 65mS, but can be changed by writing to the range register at location 2. If you do so, then you will likely need to change the analogue gain by writing to location 1. See the Changing Range and Analogue Gain sections below. Location 1 is the onboard light sensor. This data is updated every time a new ranging command has completed and can be read when range data is read. The next two locations, 2 and 3, are the 16bit unsigned result from the latest ranging - high byte first. The meaning of this value depends on the command used, and is either the range in inches, or the range in cm or the flight time in uS. A value of zero indicates that no objects were detected. There are up to a further 16 results indicating echo's from more distant objects. The are three commands to initiate a ranging (80 to 82), to return the result in inches, centimeters or microseconds. There is also an ANN mode (Artificial Neural Network) mode which is described later and a set of commands to change the I2C address. To initiate a ranging, write one of the above commands to the command register and wait the required amount of time for completion and read as many results as you wish. The echo buffer is cleared at the start of each ranging. The first echo range is placed in locations 2,3. the second in 4,5, etc. If a location (high and low bytes) is 0, then there will be no further reading in the rest of the registers. The default and recommended time for completion of ranging is 65mS, however you can shorten this by writing to the range register before issuing a ranging command. Light sensor data at location 1 will also have been updated after a ranging command. ANN mode (Artificial Neural Network) is designed to provide the multi echo data in a way that is easier to input to a neural network, at least I hope it is - I've not actually done it yet. ANN mode provides a 32 byte buffer (locations 4 to 35 inclusive) where each byte represents the 65536uS maximum flight time divided into 32 chunks of 2048uS each - equivalent to about 352mm of range. If an echo is received within a bytes time slot then it will be set to no-zero, otherwise it will be zero. So if an echo is received from within the first 352mm, location 4 will be non-zero. If an object is detected 3m away the location 12 will be non-zero (3000/352 = 8) (8+4=12). Arranging the data like this should be better for a neural net than the other formats. The input to your network should be 0 if the byte is zero and 1 if its non-zero. I have a SOFM (Self Organizing Feature Map) in mind for the neural net, but will hopefully be useful for any type. Locations 2,3 contain the range of the nearest object converted to inches, cm or uS and is the same as for Ranging Mode. You do not have to use a timer on your own controller to wait for ranging to finish. You can take advantage of the fact that the SRF08 will not respond to any I2C activity whilst ranging. Therefore, if you try to read from the SRF08 (we use the software revision number a location 0) then you will get 255 (0xFF) whilst ranging. This is because the I2C data line (SDA) is pulled high if nothing is driving it. As soon as the ranging is complete the SRF08 will again respond to the I2C bus, so just keep reading the register until its not 255 (0xFF) anymore. You can then read the sonar data. Your controller can take advantage of this to perform other tasks while the SRF08 is ranging. The maximum range of the SRF08 is set by an internal timer. By default, this is 65mS or the equivalent of 11 metres of range. This is much further than the 6 metres the SRF08 is actually capable of. It is possible to reduce the time the SRF08 listens for an echo, and hence the range, by writing to the range register at location 2. The range can be set in steps of about 43mm (0.043m or 1.68 inches) up to 11 metres. The range is ((Range Register x 43mm) + 43mm) so setting the Range Register to 0 (0x00) gives a maximum range of 43mm. Setting the Range Register to 1 (0x01) gives a maximum range of 86mm. More usefully, 24 (0x18) gives a range of 1 metre and 140 (0x8C) is 6 metres. Setting 255 (0xFF) gives the original 11 metres (255 x 43 + 43 is 11008mm). There are two reasons you may wish to reduce the range. 2. To be able to fire the SRF08 at a faster rate. If you only wish to get at the range information a bit sooner and will continue to fire the SRF08 at 65ms of slower, then all will be well. However if you wish to fire the SRF08 at a faster rate than 65mS, you will definitely need to reduce the gain - see next section. The range is set to maximum every time the SRF08 is powered-up. If you need a different range, change it once as part of your system initialization code. The analogue gain register sets the Maximum gain of the analogue stages. To set the maximum gain, just write one of these values to the gain register at location 1. During a ranging, the analogue gain starts off at its minimum value of 94. This is increased at approx. 70uS intervals up to the maximum gain setting, set by register 1. Maximum possible gain is reached after about 390mm of range. The purpose of providing a limit to the maximum gain is to allow you to fire the sonar more rapidly than 65mS. Since the ranging can be very short, a new ranging can be initiated as soon as the previous range data has been read. A potential hazard with this is that the second ranging may pick up a distant echo returning from the previous "ping", give a false result of a close by object when there is none. To reduce this possibility, the maximum gain can be reduced to limit the modules sensitivity to the weaker distant echo, whilst still able to detect close by objects. The maximum gain setting is stored only in the CPU's RAM and is initialized to maximum on power-up, so if you only want do a ranging every 65mS, or longer, you can ignore the Range and Gain Registers. Note - Effective in Ranging Mode only, in ANN mode, gain is controlled automatically. Note that the relationship between the Gain Register setting and the actual gain is not a linear one. Also there is no magic formula to say "use this gain setting with that range setting". It depends on the size, shape and material of the object and what else is around in the room. Try playing with different settings until you get the result you want. If you appear to get false readings, it may be echo's from previous "pings", try going back to firing the SRF08 every 65mS or longer (slower). If you are in any doubt about the Range and Gain Registers, remember they are automatically set by the SRF08 to their default values when it is powered-up. You can ignore and forget about them and the SRF08 will work fine, detecting objects up to 6 metres away every 65mS or slower. The SRF08 has a light sensor on-board. A reading of the light intensity is made by the SRF08 each time a ranging takes place in either Ranging or ANN Modes ( The A/D conversion is actually done just before the "ping" whilst the +/- 10v generator is stabilizing). The reading increases as the brightness increases, so you will get a maximum value in bright light and minimum value in darkness. It should get close to 2-3 in complete darkness and up to about 248 (0xF8) in bright light. The light intensity can be read from the Light Sensor Register at location 1 at the same time that you are reading the range data. 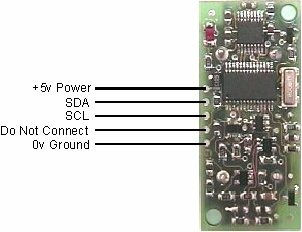 To change the I2C address of the SRF08 you must have only one sonar on the bus. Write the 3 sequence commands in the correct order followed by the address. Example; to change the address of a sonar currently at 0xE0 (the default shipped address) to 0xF2, write the following to address 0xE0; (0xA0, 0xAA, 0xA5, 0xF2 ). These commands must be sent in the correct sequence to change the I2C address, additionally, No other command may be issued in the middle of the sequence. The sequence must be sent to the command register at location 0, which means 4 separate write transactions on the I2C bus. When done, you should label the sonar with its address, however if you do forget, just power it up without sending any commands. The SRF08 will flash its address out on the LED. One long flash followed by a number of shorter flashes indicating its address. The flashing is terminated immediately on sending a command the SRF08. The above values are for guidance only, they are not tested on production units. You can't! This is a question which crops up regularly, however there is no easy way to reduce or change the beam width that I'm aware of. The beam pattern of the SRF08 is conical with the width of the beam being a function of the surface area of the transducers and is fixed. The beam pattern of the transducers used on the SRF08, taken from the manufacturers data sheet, is shown below.